The influenza virus hemagglutinin (HA) is the viral protein that attaches to cell receptors. The HA also plays an important role in the release of the viral RNA into the cell, by causing fusion of viral and cellular membranes. HA must be cleaved by cellular proteases to be active as a fusion protein. The HA on the influenza virion is a trimer: it is made up of three copies of the HA polypeptide. 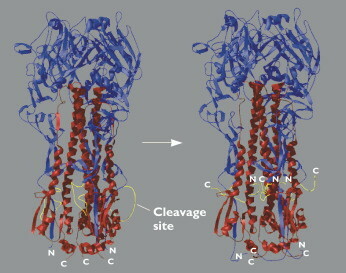 The cleavage site for cell proteases on the HA protein is located near the viral membrane. In the diagram, the globular head of the HA protein, which attaches to cell receptors, is at the top, and the viral membrane is at the bottom. For clarity, only one HA cleavage site is labeled. The uncleaved form of the protein is called HA0; after cleavage by a cellular enzyme, two proteins are produced, called HA1 (blue) and HA2 (red). The two subunits remain together at the surface of the virus particle. The new amino(N)-terminal end of HA2 that is produced by cleavage contains a sequence of hydrophobic amino acids called a fusion peptide. During entry of influenza virus into cells, the fusion peptide inserts into the endosomal membrane and causes fusion of the viral and cell membranes. Consequently, the influenza viral RNAs can enter the cytoplasm. The fusion process is described in a previous post. If the HA protein is not cleaved to form HA1 and HA2, fusion cannot occur. Therefore influenza viruses with uncleaved HA are not infectious. Cleavage of the viral HA occurs after newly synthesized virions are released from cells. Influenza viruses replicate efficiently in eggs because of the presence of a protease in allantoic fluid that can cleave HA. However, replication of many influenza virus strains in cell cultures requires addition of the appropriate protease (often trypsin) to the medium. In humans, influenza virus replication is restricted to the respiratory tract, because that is the only location where the protease that cleaves HA is produced. However, the HA protein of highly pathogenic H5 and H7 avian influenza virus strains can be cleaved by proteases that are produced in many different tissues. As a result, these viruses can replicate in many organs of the bird, including the spleen, liver, lungs, kidneys, and brain. This property may explain the ability of avian H5N1 influenza virus strains to replicate outside of the human respiratory tract. Like the HA proteins of highly pathogenic H5 and H7 viruses, the HA of the 1918 influenza virus strain can also be cleaved by ubiquitous cellular proteases. Consequently, the virus can replicate in cell cultures in the absence of added trypsin. The H5 and H7 HA proteins have multiple basic amino acid residues at the HA1-HA2 cleavage site which allows cleavage by widely expressed proteases. But the 1918 H1 HA does not have this feature. Nor does the 1918 N1 help recruit proteases that cleave the HA, a mechanism that allows the A/WSN/33 influenza virus strain to multiply in cells without trypsin. An understanding of how the 1918 H1 HA protein can be cleaved by ubiquitous proteases is essential for understanding the high pathogenicity of this strain. Due to the role of trypsin for infectivity, what role would alpha one antitrypisn deficiency play in those who become infected with influenza-particularly this H1N1 strain? Also-would the alpha one antityrpsin deficiency make it more likely for someone to become infected with influenza and/or this strain of influenza? I am a novice so bear with me. I wondered if because the absence of A1At allows elastase to break down elastin in the lung and because elastase is said to break down cytokines-is it possible then that alpha one anti-trypsin deficient individuals would be protected from the possibility of a cytokine storm? The effect of influenza of course would lead to lung damage from the lack of protection A1AT offers-but would the lack of it offer protection from something more severe such as a cytokine storm? Is the HA always cleaved extracellularly? Is it ever cleaved during protien modification in the golgi? cleaved into HA1 and HA2 by furins in the trans-Golgi network. Thank you for this information. Have you seen any reports of a mutation that would change the type of protease capable of cleaing the 2009 H1N1? I'm asking because of the number of cases of encephalitis/encephalopathy we're seeing n children from a virus that one wouldn't expect to be neurotropic. we haven't recovered virus form the CNS, but the clinical syndrome is unusual. SInce it has occurred in almost 3% of hospitalized children in my area, I thought it might be worth looking into what mutations may have been described. these mutations. As far as I know this strain is not neurotropic. Thats interesting and thanks for the information you are providing. pls bear with me for the question. As the HA pass through TGN, is it possible that it can bind to the host proteins bearing sialic acid? if so, Then NA should work from TGN. Is there any report showing that inhibition of NA can accumulate HA in TGN? any known host protein interacting with HA in TGN and retain HA for short period of time? untill, NA cleaves it to release HA to go plasma membrane. 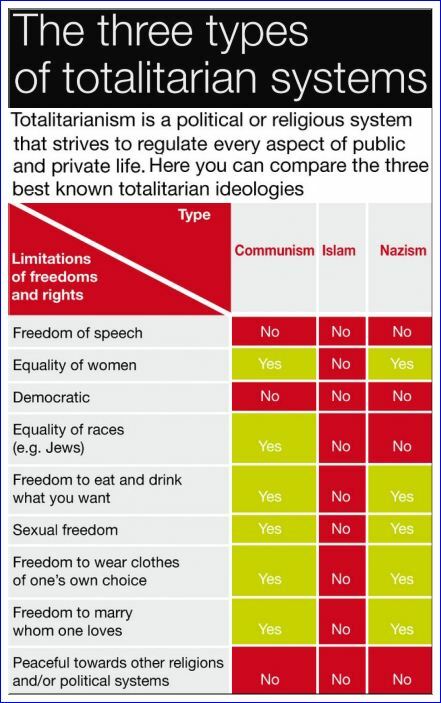 What about H1 subtype? Does it needs extracellular or intracellular protease to cleave HA0 to HA1 and HA2? How powerful must the cleavage be? thank you very much for the simply valuable illustrated information. Yes thank you for smoking gun- so nice to dig up 1918 flu which was only present and introduced by returning military men- who were all vaccinated. It becomes clear that viruses need animal trypsin to cleave to the human cell. An animal illness made infectious by recombining it with trypsin to activate cleavage . Nagalase is benign w/ o trypsin and I guess you must get that from pigs because humans do not produce it right. So its safe to say we wouldnt ever get cancers or viruses like 1918 flu unless it was created in a bio weapons lab to infect us right? Holy conspiracy theorist uneducated crazy person, Batman! I will necro this for a very simple reason: to ask everyone for all of eternity to ignore Leslie Katzenmeier. – it’ll take too long to go into the 1918 flu, but I am going to assume she’s just making things up, because it’s too much dumb concentrated into one sentence. Just…no. Nm, it’s a waste of time trying to explain things to people like Leslie, I just hope no one else that reads here believes a single crazy word from that person.